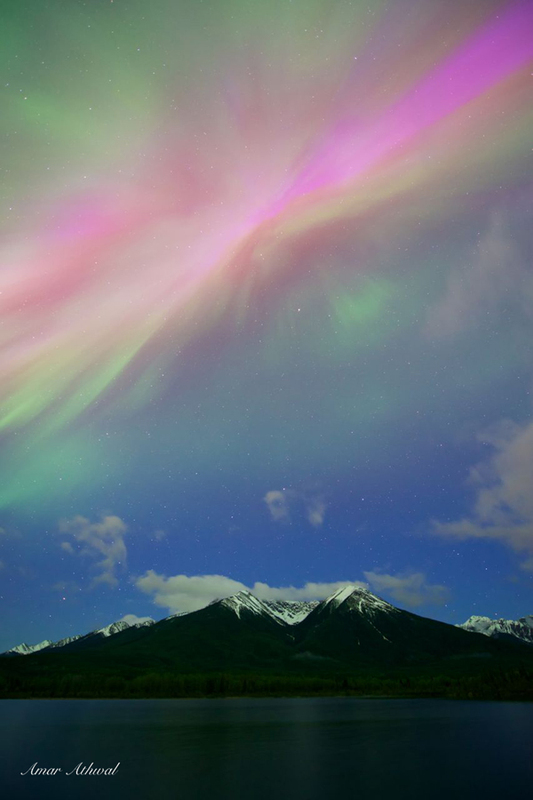 Last week Wednesday night the bright Northern Lights covered much of the sky for a short period of time. 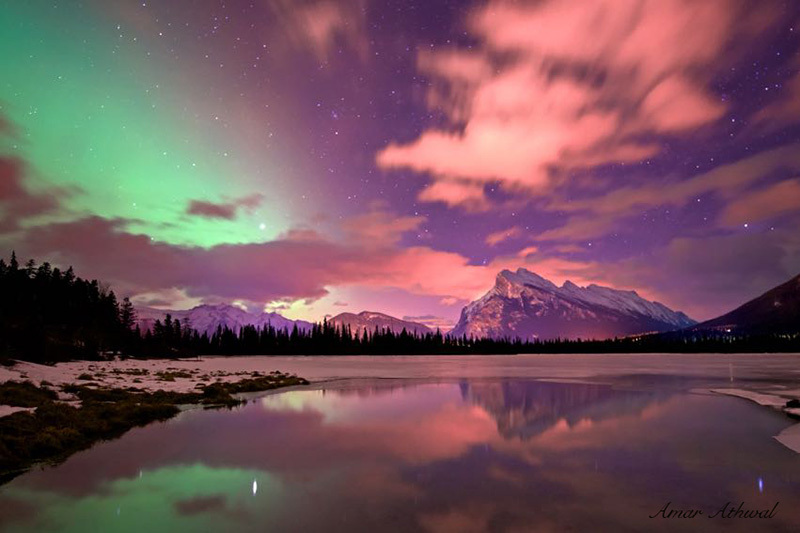 As soon as I stepped outside, the lights were clearly visible in town, even with the Banff street lights. I decided that was the night I was going to take pictures of the Northern Light from town. Went to few location including next to the Bow River. The brightness from the town lights made it difficult getting the reflection on the water of the lightsbut I was able to for some of the stars, including the big dipper. It was a night losing some sleep over. 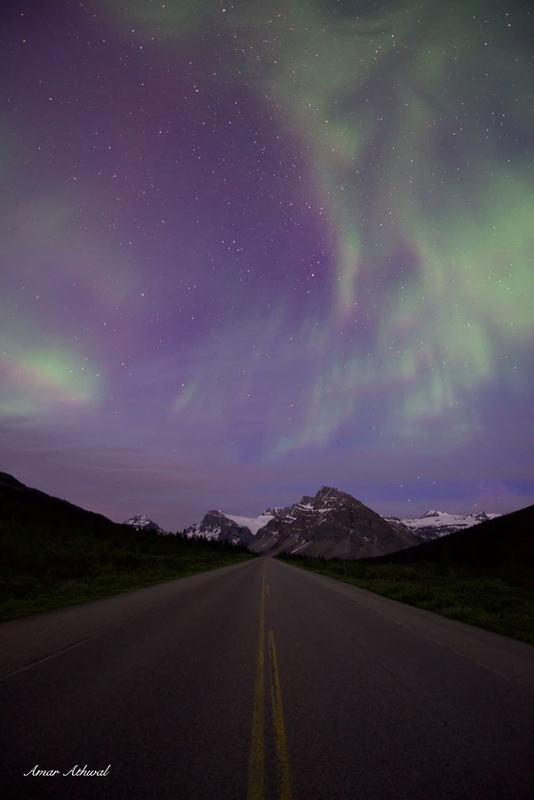 Less then a week ago the night sky was lit up with Northern Lights, they were so bright in Banff National Park, one could see them in the town of Banff surrounded by street lights. It seems like half of the town was up to watch, while the other half slept, only to find out in the morning what they missed. 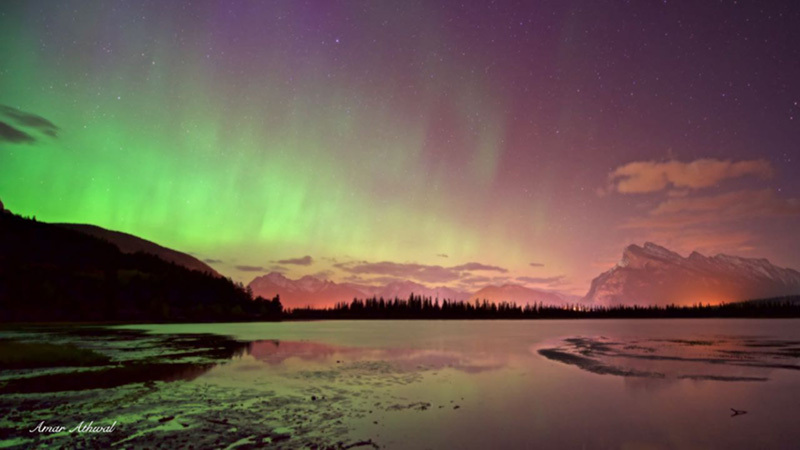 There are far more reliable place to watch Northern Lights in Canada, but that night you would have thought Banff was on that list. When you can look south and or stand in town and still see the lights, then it was a special night.. If you missed it, eat chocolate everyday until the next aurora borealis night. 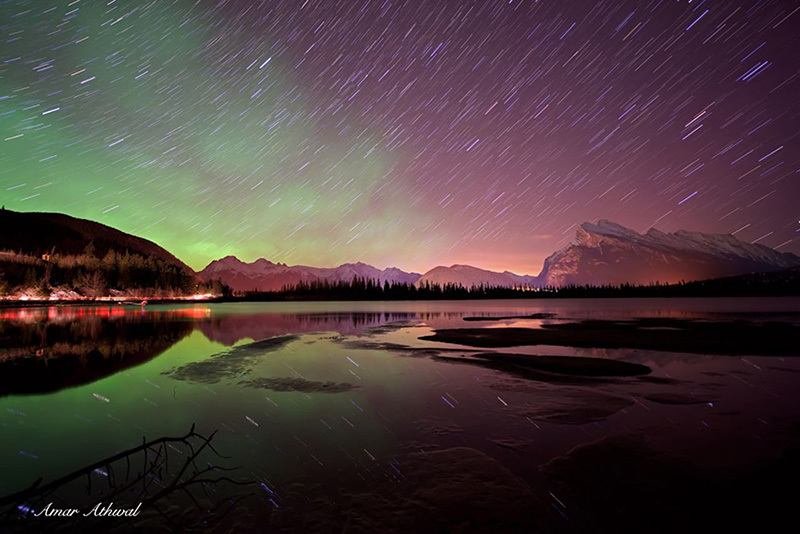 Most of the times when we get northern Lights in Banff, we don't see the colours, just a glow in the northern sky. This was the case few weeks back when I decided to go out and take pictures of it. My camera's sensor being more powerful than my eyes, they were able to pick up the green. Then it was matter of finding some open water and compose a picture. As soon as I stepped outside around 11 pm, I could see the flicking of light in the dark sky, the Northern Lights were dancing. After a quick drive, I was on a trail I walked more times then I can count. With light on my head and in hand, I stopped along the the section of the rivers that had the calm water to take pictures from, I was the only one there taking pictures. I wanted to avoid where the crowds were, but after few hours I head in that direction, hoping most had made their way home. I was right, I found a quite spot shared by one other, who was out there for the same reason, to watch nature's firework. Few nights ago we had an amazing Northern Lights show in the park. The lights were visible as soon it was dark and continued most of the night. 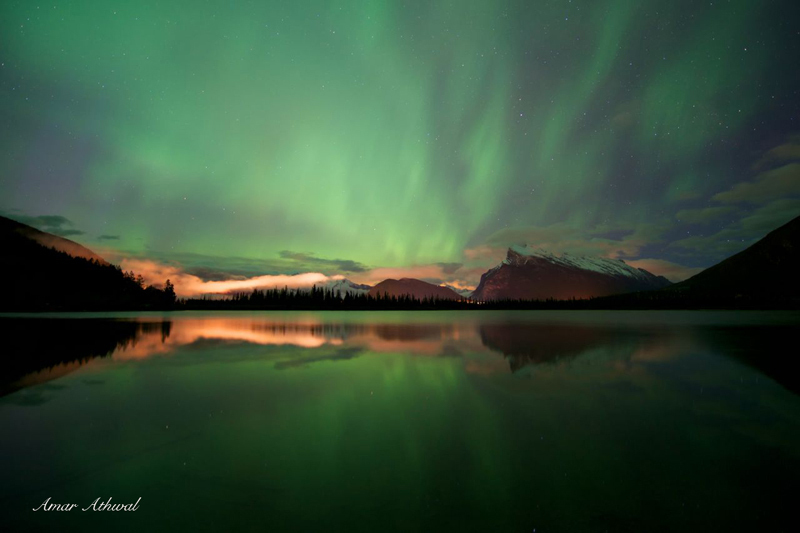 I spent time on both side of the Bow Valley taking pictures, at times the lights were visible any direction I looked. I only left for home when the show winded down, what a night. It was a good thing I had the following day off, because the night was short the northern lights did not become visible until well after mid-night and few hours later dawn was on its way. 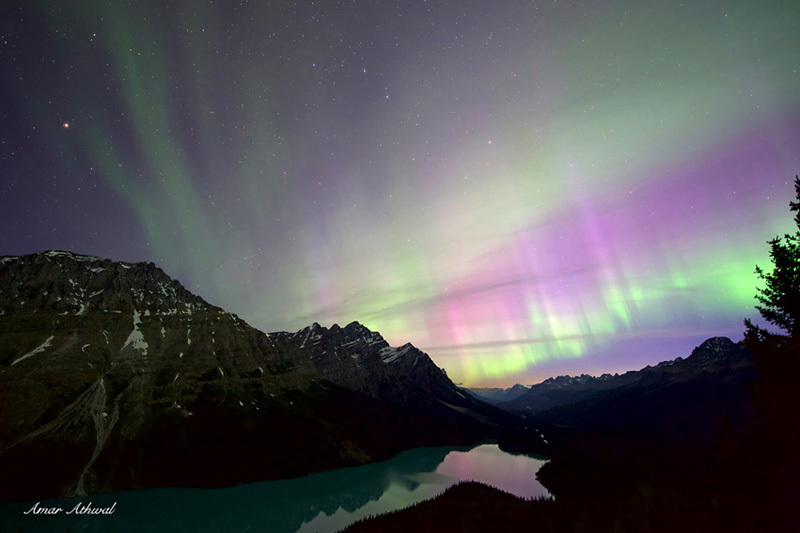 But before that took place, many of us got to see a beautiful light show in the sky, thanks to the Northern lights. One of the brightest moment was seeing a very bright shooting star, did not get a picture of it, but something my brain will never let me forget. Once I was finish shooting the lights, I though I get an hour of rest before getting pictures of the sunrise. I was too excited to get any rest, before I knew it I was looking for a different spot to take pictures of the sunrise around Peyto Lake. The sunrise was great as well, picture of that a another time. Another picture from that special night. I like many other stopped taking pictures that night not because the light show stopped, but because we started running out of darkness. In this picture I was looking south, that's how great the night was. It was the night of Northern Lights. With the warm weather it was not hard to time outside taking in the lights and taking as any pictures I could. Left where most were watching and taking pictures of the Northern Lights to a quite place. I decided to to do long exposures to create star trails, but there is always a chance one takes. In this case others playing a role in the picture unintentionally. In this case a car leaving on the right. I decided to let it be part of the end picture. 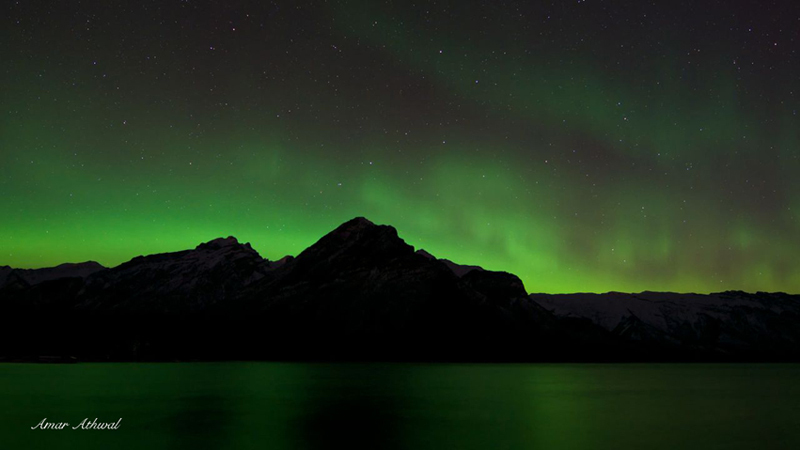 Joined many others at Lake Minnewanka to take pictures of the Northern Lights. It was a warm night, making it easier to be out there for few hours, enjoying the event. 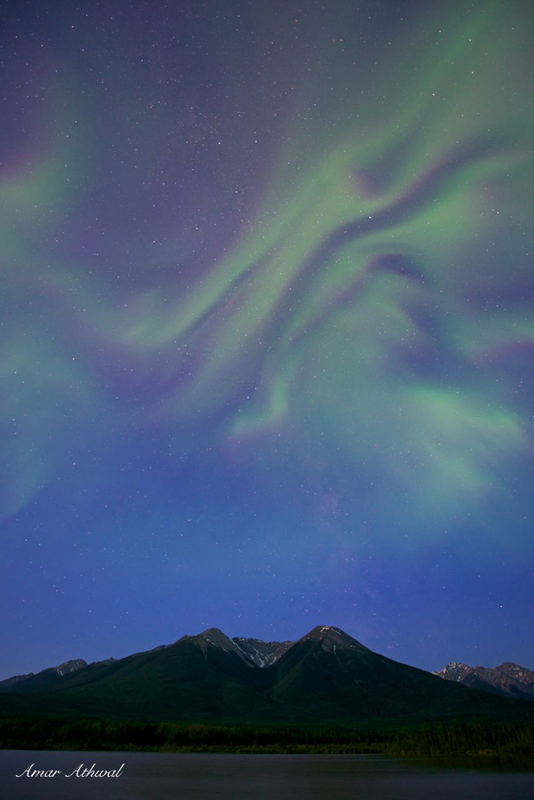 I have been missing out on the lights the last few times, so it was great fun to be out there to watch one of nature's wonder. This image is the last of the series taken few nights ago. 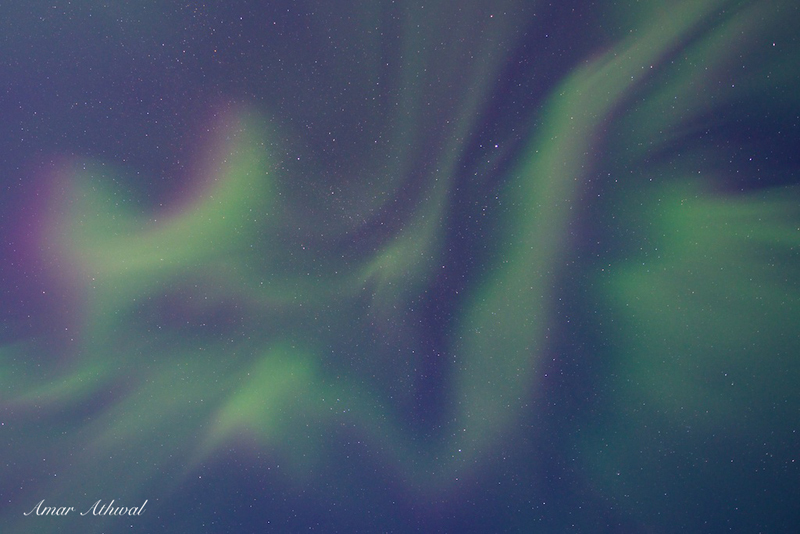 Before the clouds moved in, my eyes and of course the camera's sensor could see the Northern Lights. I was bit under the weather that night, but it was hard staying inside. Glad I got out. Few nights ago I was outside looking and taking pictures of Northern Lights. They were not as bright as I have seen other nights this year, but the camera's sensor was doing its magic. I thought I was heading for my bed, but an email came through, indicating there was a possibility of Northern Lights. Ten minutes later I was on my way out and another ten minutes more, I was taking pictures of Northern Lights. Even though the camera's sensor sees lot more then my naked eyes, the more my eyes got used to the night, the better the lights got. 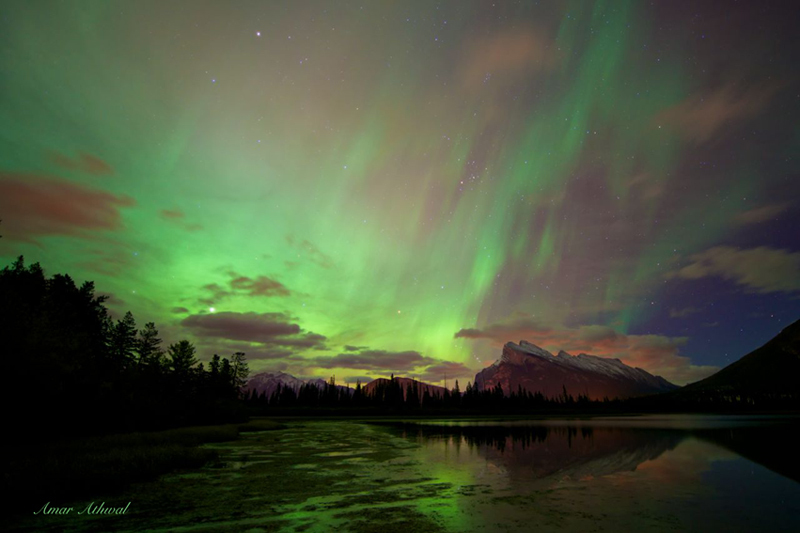 We had a beautiful night in Banff, the sky was full of Northern Lights. The mind wanted to stay out but the body needed rest. 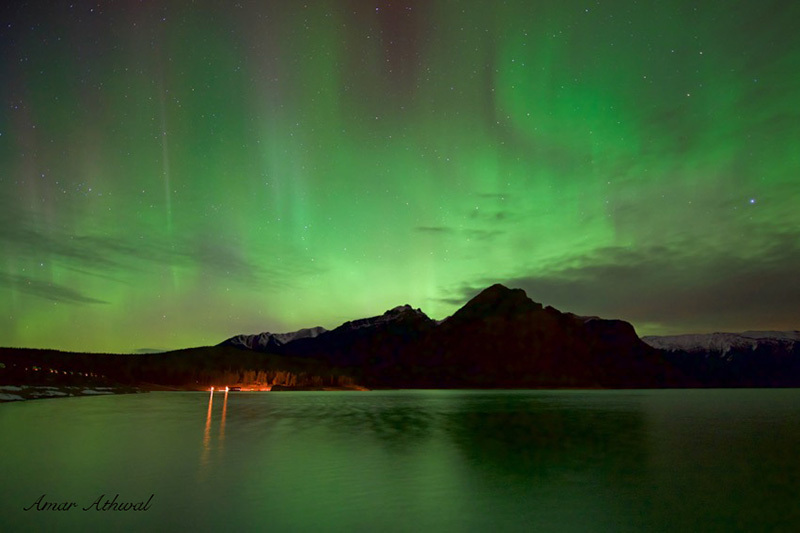 Another Northern Lights picture from few nights back, with the Sundance Range below. Last night the sky was just amazing. As great as it was seeing the northern lights last Friday, the camera's sensor always picks up more colours and details. For this images I was actually looking south, the light show was that good. The moon was making its way up and helped bring out the blue sky and the details in the landscape as well. It was a beautiful night worth losing sleep over. 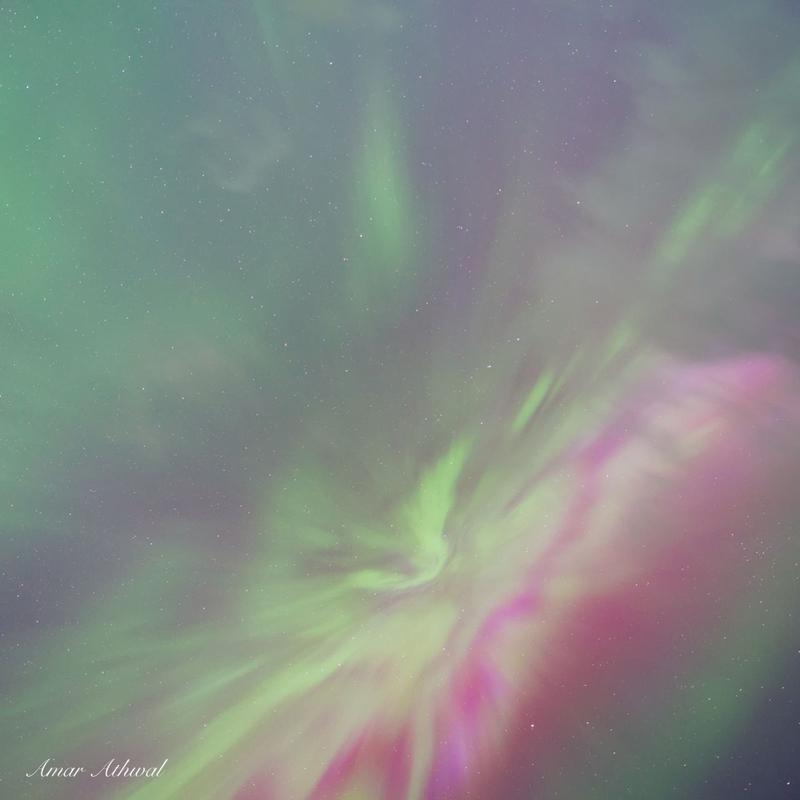 Another northern lights picture from last Friday, when nature put on a great show. Can't wait for the next one. One picture from a beautiful night. Few nights ago I was trying to take pictures of Northern Lights. The event did not last too long and the intensity was low as well. Nonetheless I came away with couple of good images.